Personality: Kuroi loves water pokemon. He has always been fond of them since his early years. Kuroi is very intelligent and is caring. He never gets frustrated at his pokemon or anybody. He has a rare tendency to get angry, the only reason he would get angry was if someone bullies pokemon or hurts them. History: His life has never really been complicated. Living in Oceana City all his life he developed an early love for water. His parents taught him everything about water pokemon. They were trainers themselves, so it was in the family for Kuroi to become a trainer. One day while walking threw the city he heard something screaming for help. He ran in that direction where the screaming was coming from. He kept going until he saw a injured Totodile lying in the streets. He stood from a distance as people walked away from it leaving it there. He walked over to the Totodile and picked him up carrying him back to his place. Ever since then him and Totodile have been the best of friends. 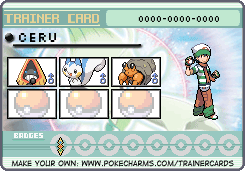 Now being 17 it is time for Kuroi to start his pokemon adventure with Totodile. -- YOU ONLY START OFF WITH A SINGULAR STARTER POKEMON. Other Pokemon are obtained through capturing, trading and events. Motto: "See the power of the water pokemon"